"I like being able to fire people who provide services to me," he said. "You know, if someone doesn't give me the good service I need, I want to say 'You know, I'm going to go get someone else to provide that service to me.'" Romney's rivals pounced on seven words of that speech: "I like being able to fire people." Team Romney was equally quick to call foul, saying the remarks were taken out of context. But at least part of the problem for Romney may be that he said those words at all - as they feed the already common criticism from his opponents that he is an aloof businessman. The Democratic National Committee released a derisive web video and called Romney "out of touch." The campaign of Texas Gov. Rick Perry looped Romney's words to make a cell phone ring tone that quickly went viral. 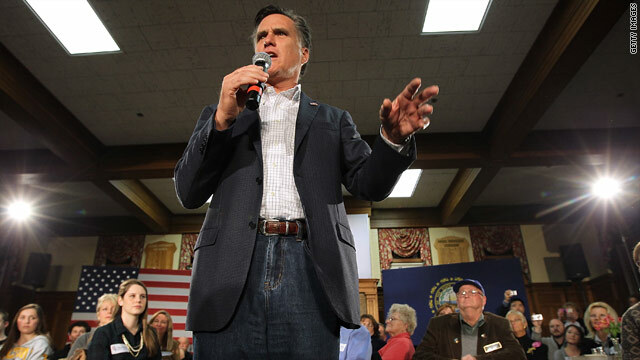 On the trail, many of Romney's GOP rivals used the candidate's words to further another line of attack: that Romney was a high-flying corporate executive who profited from failed companies. The Romney campaign pushed back vehemently against the attacks, which quickly became the biggest political story of the day, and argued the mockery was irresponsible and unfair. So what exactly did Romney say? "I want people to be able to own their own insurance if they wish to, and to buy it for themselves and perhaps keep it the rest of their life, and to choose among different policies offered from companies across the nation. I want individuals to have their own insurance. That means the insurance company will have an incentive to keep you healthy. It also means that if you don't like what they do, you can fire them. I like being able to fire people who provide services to me. You know, if someone doesn't give me the good service I need, I want to say 'You know, I'm going to go get someone else to provide that service to me.' So, that's one thing I would change." Asked whether Romney regretted his phrasing, Communications Director Gail Gitcho responded by e-mail: "Of course not." Comments that campaigns say are out-of-context have hurt politicians before. Sen. John Kerry was successfully painted as a flip-flopper after saying: "I actually did vote for the $87 billion before I voted against it" in regards to a wartime funding bill. Kerry was talking about arcane Senate procedure, but his explanation got lost in the wash and his opponents gleefully exploited the stumble. And the Romney campaign itself was faulted earlier in the year for taking President Obama's words out of context in a campaign ad. Romney's first campaign commercial showed then-candidate Obama quoting Sen. John McCain - but neglected to explain Obama was quoting. In response to the ensuing controversy, Romney senior adviser told The Boston Globe the Democrats' furious response to the ad was "hysterical." –CNN Political Correspondent Jim Acosta contributed to this report. I guess he'll pick up Trump's endorsement. If this is all they can do to try and bring him down, it must be good to be Romney. I was not a fan before, but he now has my vote tomorrow. Team Romney!!!!!!!!!!!!! Team Romney..you reap what you sow! I guess the Romney campaign doesn't remember their recent ad where then candidate Obama words were grossly taken out of context. "Ain't no fun when the rabbit got the gun!" Every single candidate this past week has claimed that something they said has been "taken out of context." Can we please have someone mean what they say and say what they mean? That alone would be refreshing. Maybe things wouldn't be taken out of context if they hadn't already demonstrated how they will go any way the wind blows. What good would it do to fire an insurance company after they dropped you for getting sick? Is there any Republican candidate who will address the flip side of this insurance problem? They all appear to think it is O.K. for the insurance companies to "fire" costly clients to protect their profits. What regulations will they put in place to protect people from being dropped or denied coverage because their care might prove to be not profitable for the insurance company? Even in context, Romney likes being able to fire people at this time unfortunately reveals how aloof and elite Mitt Romney really is as a candidate. When has Romney ever had to worry about a pink slip? Other than the pink slips Romney handed out from Bain Capital firing American workers and sending jobs overseas.